Don’t worry, we’re still here! A little background- in 1991, I founded Oberwerk Corporation as a software development company. After a decade of writing code 12 hours a day, I decided to turn my binocular hobby into a business as I transitioned away from software development. I registered the domain name “bigbinoculars.com” and built an e-commerce website for our new Oberwerk binocular brand. For the next 17 years, I enjoyed continuously tweaking that site to keep up with the latest in web design and technology. But as web technology advanced, I found it increasingly difficult to be a part-time webmaster- especially with more and more of my day spent testing/tuning binoculars, as well as handling customer emails and phone calls. Therefore I (somewhat reluctantly) turned over this task to a local ad agency, that employs some really talented developers, who rebuilt the old oberwerk.com site into a modern e-commerce website using the newest and most-secure web technology. The new oberwerk.com is secure (the entire website is “https” and is fully PCI-compliant) and it’s “responsive” (displays properly on a smartphone as well as a desktop computer). This is necessary in order for search engines to continue to rank us highly, but also because more than 50% of our web traffic is now from mobile devices. A modern site also needs embedded video, tight social media integration, real (unfiltered) product reviews, and above all, it needs to protect customer data. In other words, it needed to be built and maintained by full-time professionals. But it also needs great content, and I’ll still be primarily responsible for that. 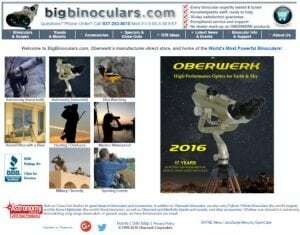 So we’re retiring the old bigbinoculars.com, it will redirect to the new oberwerk.com. Click “HOME” on the menu above to explore the new site (and update your browser bookmark). Feel free to send comments and suggestions to me at [email protected].